Welcome to the Official Home Page of the West Jersey Astronomical Society (formerly known as the Willingboro Astronomical Society). Our club is in its 51st year of serving both the public and the amateur astronomers of the Delaware Valley. We have a long history of public education, star parties, interesting meetings, in-depth training and experienced leadership. We are a 501(c)(3) tax-exempt organization. Click here for membership information (dues can now be paid through PayPal). July 20 Informal Meeting, 7:30 pm at the Virtua Health and Wellness Center in Moorestown, NJ. As always, guests are welcome and no astronomical experience is necessary. Use the Main Entrance and check with the security guard who will direct you to the conference room. July 21 Club Picnic, at Camp Ockanickon in Medford, NJ. Rain date, July 28; for members in good standing and their guests only. Members should have received an invitation from Wade Evans, the club treasurer. If not, his e-mail is on the Contacts page. July 27 Mars at Opposition, 1:13 am EDT. This will be a perihelic opposition with Mars reaching 24.3" apparent diameter and magnitude -2.8 (brighter than Jupiter). Mars is already quite distinct to the unaided eye in the night sky. Unfortunately, for the telescopic observer, Mars is now enshrouded by a global dust storm. July 27 Full Moon at 4:20 pm EDT in Capricornus. At 10 pm, the full moon will be 7° above-left of Mars low in the southeast. Aug 3 Formal Meeting, 7:30 pm at the Virtua Health and Wellness Center in Moorestown, NJ. Aug 3 Star Watch at the Rancocas Nature Center in Westhampton, NJ. 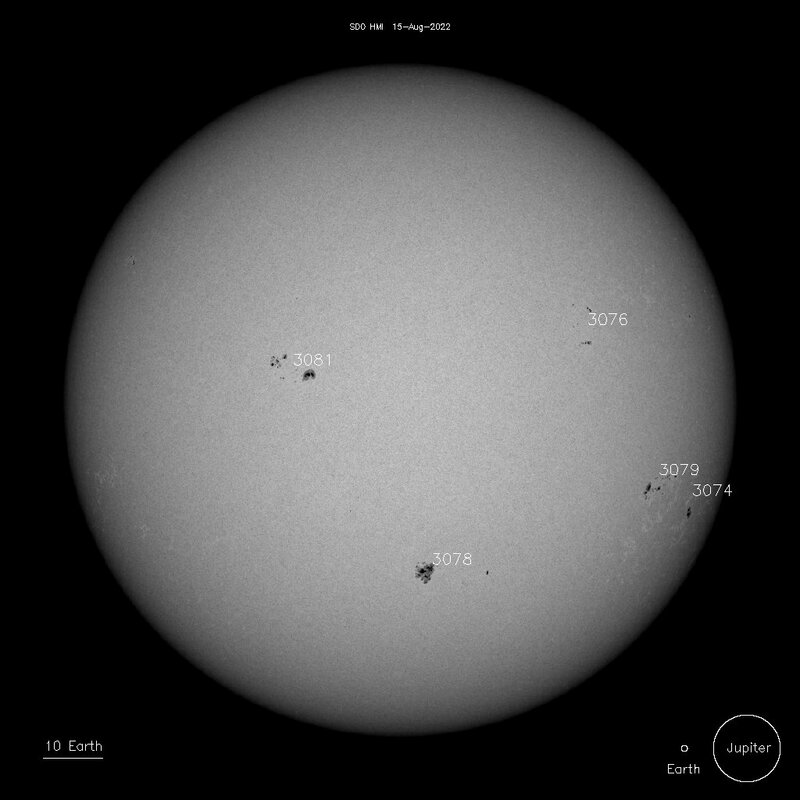 WAS members will provide astronomical support and telescopes. Starts at 7:30 pm, rain date August 10. Here's the RNC flyer. Aug 4 Public Star Watch at Batsto. Check back the day of the event for the go/no-go weather call. Aug 11 New Moon at 5:58 am EDT in western Leo. Aug 11 Member Star Watch at Atsion. Check back the day of the event for the go/no-go weather call. Aug 15 Astrophotography Meeting, 7 to 9 pm at the Virtua Health and Wellness Center in Moorestown, NJ. The next Astrophotography meeting will be on September 27. 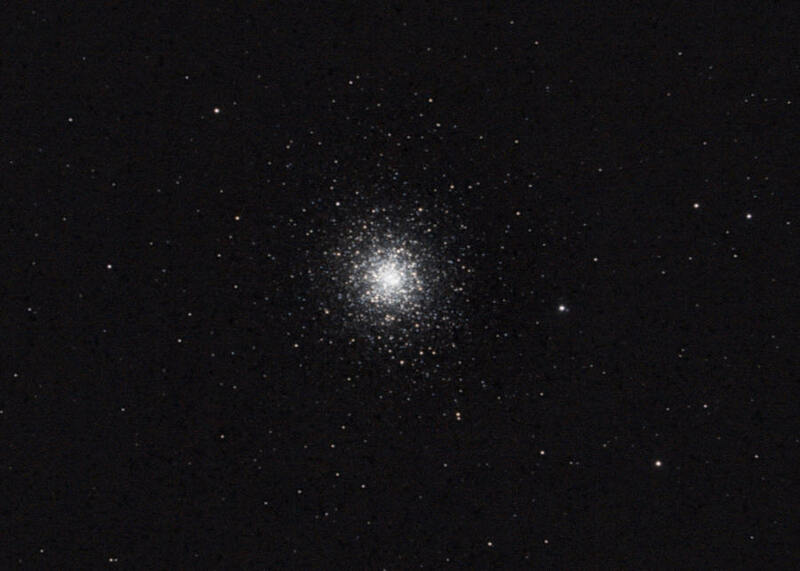 Club member Howard Schneck captured this image of the globular cluster, M92 in the constellation Hercules. 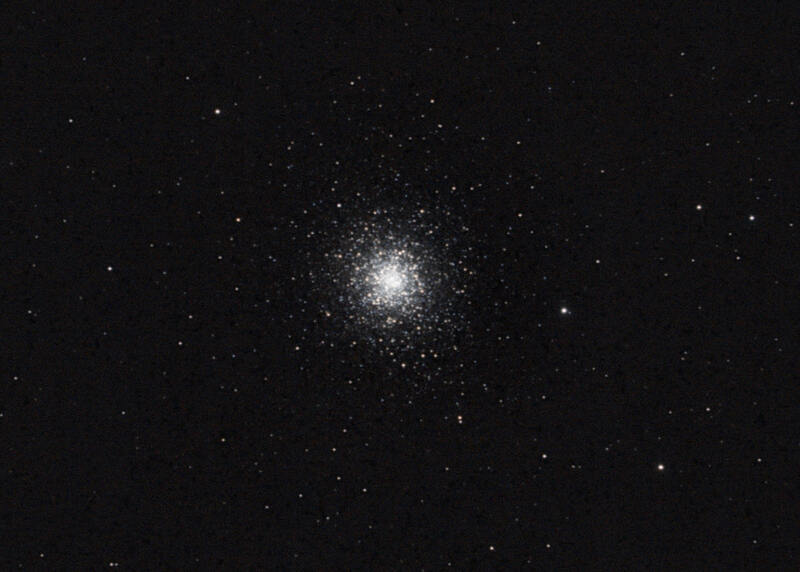 This fine object is often overshadowed by its famous neighbor, M13. It was taken around 1 am on July 1, 2018, from Mount Laurel, NJ (a suburban location, not a dark site, plus there was a 92% illuminated moon in the sky). Howard used a Canon T3i digital SLR camera at the prime focus of a Celestron Edge HD8 Schmidt-Cassegrain telescope with a 0.7x reducer. Guiding was accomplished with a ZWO ASI120MM-S camera and an Orion telescope, all riding a Skywatcher NEQ6 German equatorial mount. Twelve two-minute subs were taken at ISO 800, then processed with Pixinsight using bias and dark frames. Click here for a larger version.